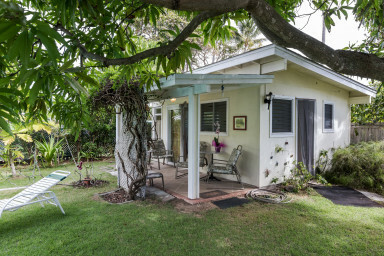 Freestanding Cottage with private bath and private entrance, kitchenette, pool, in a quiet location close to Kailua Beach Park. New, light and airy one room cottage with queen sized bed, bath, kitchenette, out door sitting area by the pool. The lanai overlooks the tropical garden and the salt water swimming pool. Quiet and peaceful. The unit has parking provided at the front of the house. Swimming pool available for use. A welcome basket of fresh fruit, juices, coffee and tea will be provided. A short walk to beautiful, world famous Kailua Beach, and to shops and restaurants in Kailua town. The kitchen has a microwave, toaster over, electric skillet, refrigerator, sink, dishes and silverware. Queen size bed, closet with plenty of towels, hair dryer, beach towels, beach mats and beach chairs are provided. We are a short walk from the beautiful world famous Kailua beach, the farmers market and from the quaint shops and the many restaurants in Kailua Town. There is a ceiling fan as well as windows on all 4 sides, so cooling will not be a problem. We also have the natural air conditioning--the windward breezes almost all the time. There is off street parking in the front of the house. We do provide beach towels, beach chairs, even snorkel equipment at no additional charge. Washer and dryer available if needed. If you're looking for out of the way Hawaii Vacation Rental, look no further. Lanikai & Kailua Beach and town is one of the nicest places on earth. Seven golf courses in a five-mile radius, tennis courts, Olympic-size pool, fabulous beaches, activity adventures, exciting shopping, and gourmet dining - Kailua has everything. Four miles of white sand beach with no Hotels, no Resorts anywhere. No time shares. No Beachfront condos. The cottage is in the perfect location.. 10 minute walk to Kailua beach and 10 minute walk to downtown Kailua. The bed is super comfortable.. generous supply of linens and towels and although the kitchen area is small you have everything you need to cook at home if you wish. Best by far though is Margaret, the owner and resident of the main house. She is welcoming, informative but respectful of your privacy. We hope to return one day. Very enjoyable stay. Terrific value. Renter next door said Margaret is a sweetheart and we agree. Unit, swimming pool, yard well maintained. . Can walk to beach and downtown. yet quiet location. Minor quibble re shower hot water; corrected near end of stay. Ants briefly, but then got rid of empty canned drinks on counter and they want away.. Would come back if revisiting Kailua. We had a fine time in our cottage. Margaret was a wonderful hostess and gave us great tips as to where to eat, go and when. We'd stay there again. Excellent ohana unit in the yard with a very tempting pool. Margaret was very welcoming. Only suggestion is a new fan might be a useful improvement as the current one only has “medium,” “slow,” and “almost stopped” speeds and a repeating pattern of clicks that could keep one awake at night if you’re sensitive to sound, but generally not too annoying. It’s a great location, and the lanai is a great respite from the heat of the day or a relaxing spot to close the day. I’d stay here again anytime. Highly recommend this place. We stayed 5 days and Margaret and Dave were the perfect host, making sure we got everything. The place was close by the beach and the commercial area, fully functional and very comfortable. The back yard with the pool is the perfect place to relax after a long day. We highly recommend this place if you are staying in Kailua. I stayed in the Tropical Garden Cottage, and had a great time. Margaret, the host, was friendly and helpful. The cottage had everything I needed to prepare a light meal or two each day, or reheat leftovers. The location, about a half-mile from the beach, was perfect ... especially on Thursday morning for the farmers market a few hundred feet away. It doesn't have AC, but the louvered windows and ceiling fan cooled it off nicely. Lovely and clean accommodations, truly a home away from home. Margaret is a wonderful, friendly and helpful host.